・Asahi Group Holdings, Ltd. ・ASAHI INDUSTRIES CO., LTD ・Kikkoman Corporation・Kewpie Corporation ・Kirin Company Limited ・Gurunavi, Inc.・Suntory Holdings Limited ・Nice Holdings, Inc. ・Nippon Paper Industries, Co., Ltd. ・The Norinchukin Bank ・B.E. Marubishi Co., Ltd. ・Yanmar Co., Ltd ・Lotte Co., Ltd.
Fascioliasis is currently endemic in five continents and has become increasing as an important food-borne trematode infection and threat to public health as well. It affects approximately 50 million people worldwide and over 180 million are at risk of infection (WHO, 2015). However, there is still a lack of awareness and informations of this emerging problem in globe, including Vietnam. Fascioliasis is a parasitic disease predominant in liverstocks and domestic ruminants, but it is now reemerging as an important human infestation, but not parasitic neglected tropical disease. Human being is an accidental host, but depending on dietary habits, there can be very high prevalence in population of particular areas, especially in South America, South East Asia countries. The epidemiological picture of human fascioliasis has changed in recent years, the number of reports of humans infected with Fasciola spp. has increased significantly step by step in the recent 10 years and some geographical areas have been considered as endemic for human. High prevalence of fascioliasis in humans does not necessarily occur in areas where fascioliasis is a major veterinary health problem. It means human fascioliasis can no longer be considered merely as a secondary zoonotic disease but must be considered to be an important human parasitic disease. In Vietnam, the emergence of fascioliasis in recent 10 year is an enigma phenomenon, especially highest prevalence and intensity in fascioliasis endemic areas of Central Highland area (especially in some Phu Yen, Binh Dinh, Khanh Hoa, Quang Ngai, Quang Nam, Gia Lai, Daklak, Quang Binh, Da Nang provices). That emergence of this large number of human cases as puzzling and set on many multidisciplinary questions. These global data update and confirmed fascioliasis ases review in Vietnam from 2007-2017 period aimed to address the key obstacles in controlling human fascioliasis with evidence-based data. Vietnam is a developing country belonging to the tropical agro-ecological zone, in which planting rice and raising cattle and buffalo are the traditional agricultural practices.Parasitic diseases are still common in cattle and buffalo, causing significant economic losses for animal husbandry, including fasciolosis, with an estimate prevalence of 0 - 60% reported in Vietnam. The data on prevalence of Fasciolosis in cattle and buffalo, the factors influenced to the prevalence of Fasciolosis, bio-characteristics of the intermediate hosts of Fasciola spp., diagnostic and treatment methods will be included in this review. In the recent years, the researches on Opisthorchis spp., Opisthorchis paragenminus in ducks raising in Binh Dinh province of Vietnam were carried out. 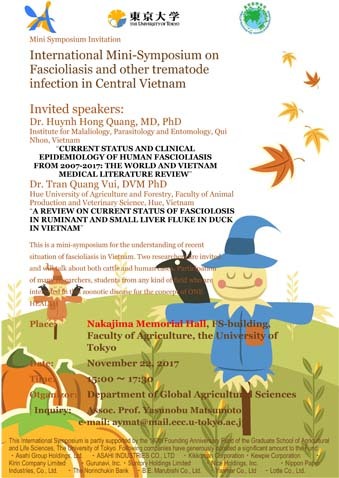 The results of these researches on prevalence of infected ducks, clinicalpathologenic signs and molecular identification for small liver fluke have been reviewed. Key words: Fasciolosis, Opisthorchis paragenminus, Vietnam.